In the United Kingdom, the name is spelled “widgeon”, with a “d”, but the spelling used by the American Ornithologists Union “official” checklist of birds drops the letter “d”. Either way, there are three species sharing the name: the American (Anas americana), the Eurasian (A. penelope), which is often just called “Widgeon” and is found through most of Eurasia (and, in winter, parts of northern Africa), and the Chiloe Wigeon (A. sibilatrix) found only in southern South America. The Eurasian Wigeon is increasingly common in North America. The American Wigeon has a wide range, breeding from Alaska, east across the prairies and in suitable marshy habitat as far as Quebec and south into the American Southwest as far as northern California. It winters along much of both coasts of North America, and from the central and southern US, south as far as the Caribbean and southern Central America. The painting is smaller than life size done in acrylics on Russian birch. Barry Kent MacKay lives and works in Ontario, Canada. Learn more. 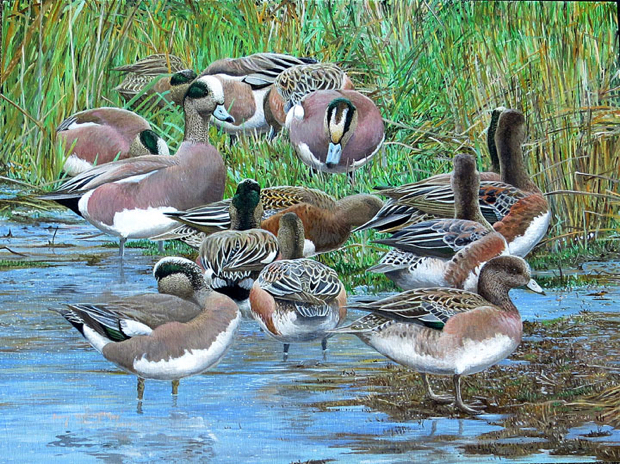 Check out this BirdNote show about the American Wigeon.